The City of Cleveland is positioning Northeast Ohio to meet the demands and expectations associated with a changing economy. While the region’s past has relied on manufacturing and heavy industry to provide wealth and jobs, it is clear that its future is rooted in an economic development strategy that recognizes research, innovation and entrepreneurship as keys to successful transformation. With this recognition comes a newfound appreciation for the quality of life amenities necessary to lure the new class of “knowledge workers” and “Millenials” to our area. It is known that exciting cultural attractions and extensive recreational opportunities rank high within their requisite quality of life package. To this end, the Towpath Trail management team has worked to extend the popular Towpath Trail Greenway into Downtown Cleveland. Canal Basin Park will serve as a gathering place, interpretive park and connective hub at the Northern end of the Towpath. Canal Basin Park includes parcels that were once occupied by the canal itself. It is Ground Zero in the history of the canal – the place where the canal poured into the Cuyahoga River; a place where greater Cleveland’s agricultural products were shipped eastward to New York City and, in turn, where the manufactured items – the tools, hardware, clothing and household items – were unloaded for Cleveland consumers. 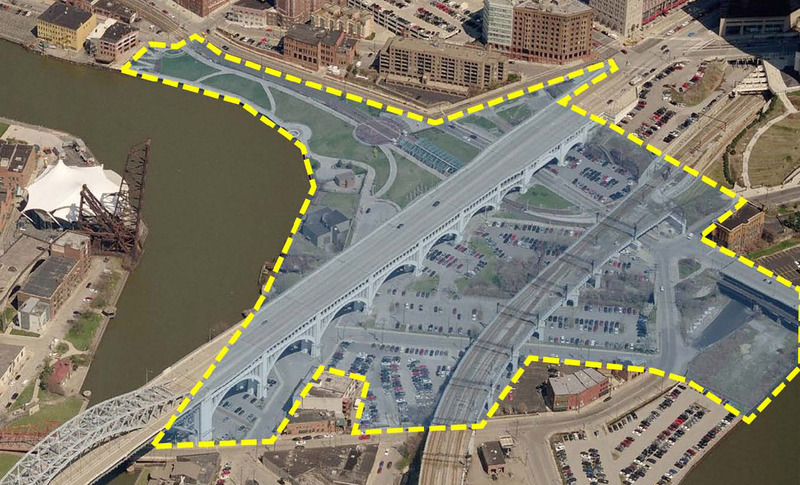 The role of Canal Basin Park, however, extends beyond the early history of Cleveland and the canal. Canal Basin introduces the stories of entrepreneurs, industry and immigration. It follows the role of the Cuyahoga from Indian times through the industrial revolution to modern times, where river reclamation is writing a new chapter. It introduces the stories of Cleveland’s immigrants – the men and women who came here to pursue and experience “the American Dream.” People like John Rockefeller, Tom Johnson and Sherwin & Williams. Canal Basin Park has benefited from three public charettes that explored the shape and size, the public uses and functions as depicted by nationally and internationally-renowned architects. The results of those planning exercise paint a bright and exciting future for a place that will celebrate Cleveland’s role in our nation’s history, while recognizing those individuals who played major roles on both stages. Canal Basin Park will provide not only a setting for education, but will introduce a major event site for concerts, fairs, and other happenings. It will integrate public art and mixed-media into an atmospheric experience, and will serve as Cleveland’s gateway to the 110-mile Canalway. It will be Cleveland’s major point of visitor orientation. Canal Basin Park will be a national model for heritage area visitor centers. In Cleveland, the Ohio & Erie Canalway features the Cuyahoga River Valley and its adjoining neighborhoods and communities. The Towpath Trail alignment wraps the river’s edge to create a “Canal Basin Park” District within its northernmost reach – the Flats. Since the River contains so many of Cleveland’s most important and historic moments, the District provides a fun and interesting way for visitors to walk, and bike along its perimeter and interact with a blend of nature and industry.